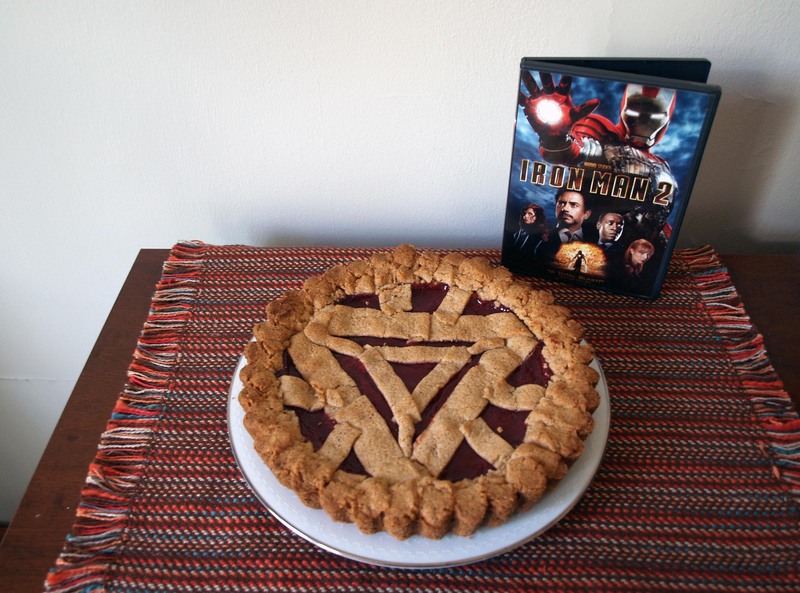 Iron Man’s Aprium Linzertorte | I Wanna Bake! What’s an aprium, you might ask? 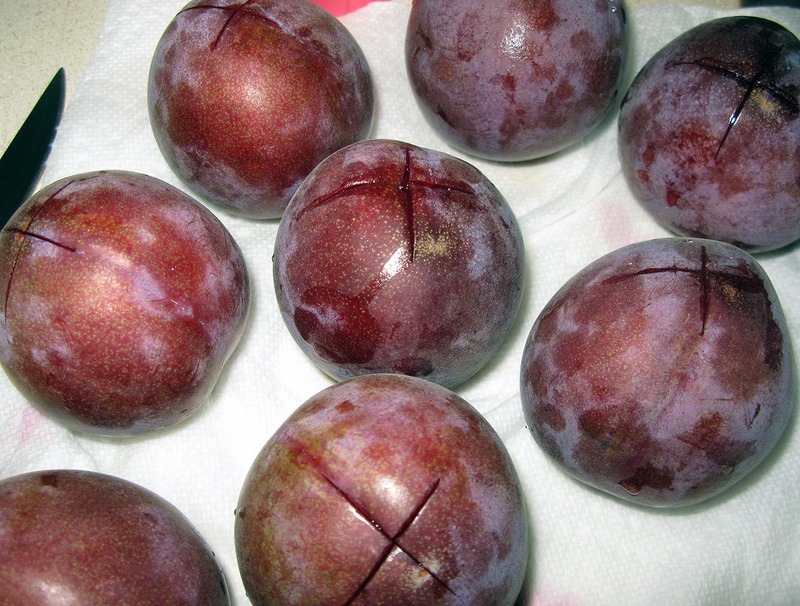 It’s a cross between an apricot (75%) and a plum (25%) that was developed in the late 1980s. 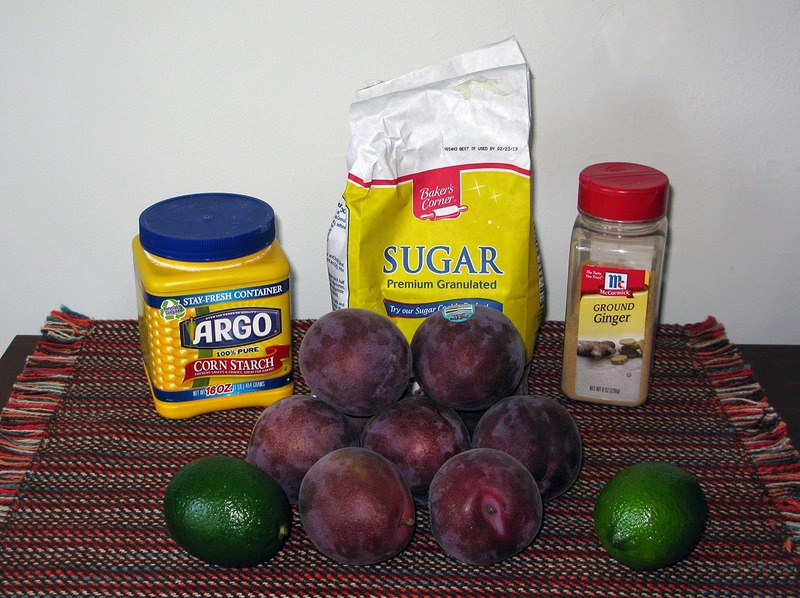 My original plan for this bakeventure had been to use pluots, but to be honest, I was willing to work with any plum/apricot hybrid, so I just went with the one that I was able to get my hands on first. I’m actually glad that this worked out the way it did, because apriums turned out to be quite delicious. The fruit is sweet and soft, with a bit of a tart aftertaste. I decided to cut the sweetness with some lime juice and zest and add some ginger for good measure, and oh boy, it was good. I want to spread that jam on everything, or just eat it with a spoon. I used this delicious jam to make my own version of a linzertorte. Linzertorte is an Austrian tart that is usually filled with raspberry or redcurrant jam. [Not to be confused with linzer hearts/sables, which I’ve always known as linzer tarts. They both use raspberry jam, but what I’ve always called a linzer tart is a heart-shaped sandwich cookie covered with powdered sugar and filled with jam with a little heart cut in the middle of the top cookie to show the filling. Just in case you had the same misconception.] To explain why I had to scour every grocery store within a 10 mile radius week after week for such a specific hybrid fruit, we need to go back to this bakeventure’s source material. According to the IMDB summary of Iron Man 2, “With the world now aware of his identity as Iron Man, Tony Stark must contend with both his declining health and a vengeful mad man with ties to his father’s legacy.” As usual, there is a lot more going on in this movie than the one-sentence summary can capture (and even more that I’m not going to discuss). We find out early on that the device that is preventing the shrapnel in Tony Stark’s chest from reaching his heart (I discuss this conundrum in more detail here) is also poisoning him via its palladium core. As Stark comes to realize over the course of the film, the problem is that he is running the device on old technology. He comes across an old film reel of his father talking about the arc reactor technology in which he explains to Tony that, while the idea is there, the technology to fully realize it doesn’t exist yet. Stark realizes that, to update the arc reactor prototype in a way that will save his life, he has to invent a new element (yes, you have to suspend your disbelief and just go with it). The new element proves to be the missing piece, saving Iron Man from certain doom and increasing the power output of the arc reactor in one fell swoop. Perhaps it’s a little bit of a stretch, but I decided to take an old classic (the linzertorte) and update it with an ingredient that didn’t exist when it was first created (the aprium). I spent a lot of time trying to come up with something that was representative of the Whiplash/Crimson Dynamo character that is Ivan Vanko, as well as a bit of time thinking about the introductions of Black Widow and Nick Fury, but in the end, the simple answer won. I followed Joy of Cooking‘s recipe for crust and baking instructions pretty closely, but added my own recipe for aprium jam in place of the raspberry jam. 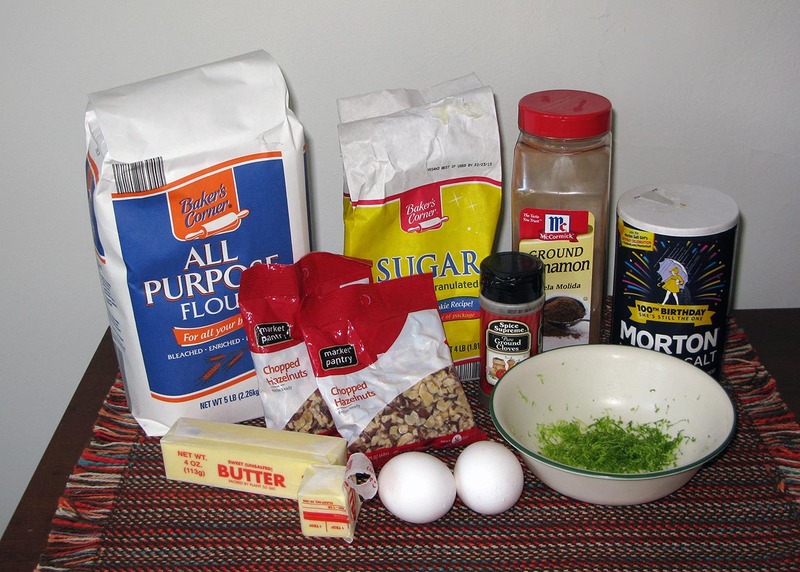 [I should probably just put a link to that cookbook in the footer of every post at this point, shouldn’t I?] You can switch out the hazelnuts for almonds if you prefer, and if don’t feel like making jam, you can substitute storebought (though I reaaaally do recommend making this aprium jam, because it’s phenomenal). They stuck with an AC/DC soundtrack for Iron Man 2, so to change it up just a bit, I’m going to suggest Back in Baroque: The String Quartet Tribute to AC/DC. If you don’t want to commit to owning this particular novelty, you can stream it for free if you have Amazon Prime. First, you’ll need to peel your apriums. To make that easier, we’re going to boil them briefly to loosen the skins. 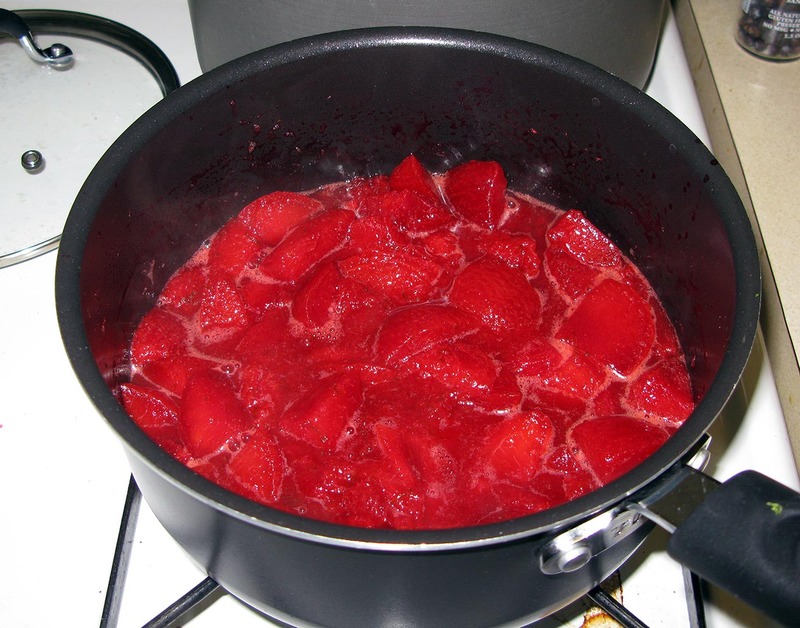 Fill a large pot with water and bring it to a boil on high heat. Rinse your apriums and score a small x on the bottom of each (this makes it easier to start the peeling). Fill a large bowl with cold water and add some ice cubes. Set this aside for now. 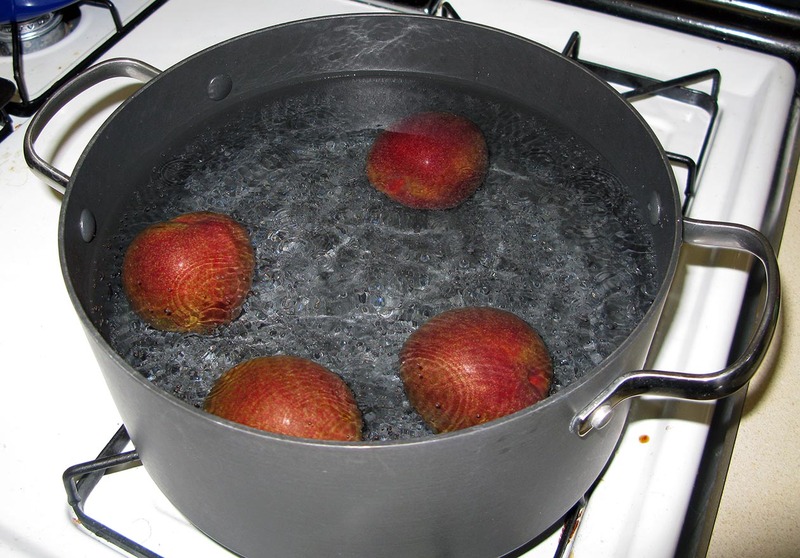 When your water reaches a rolling boil, drop in 3-4 apriums and boil them for about 30 seconds. 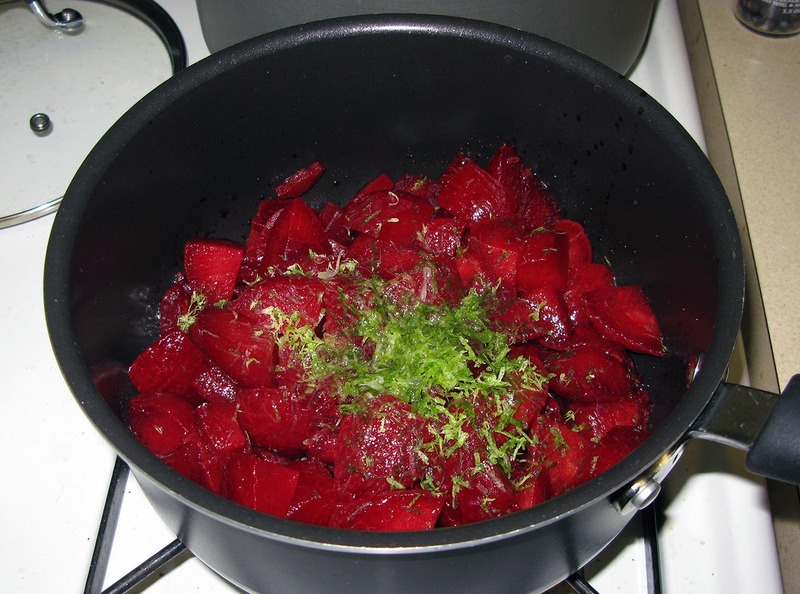 Remove them from the water with a slotted spoon or strainer and immediately drop them into the ice water. Repeat the process until all of your apriums have been boiled. 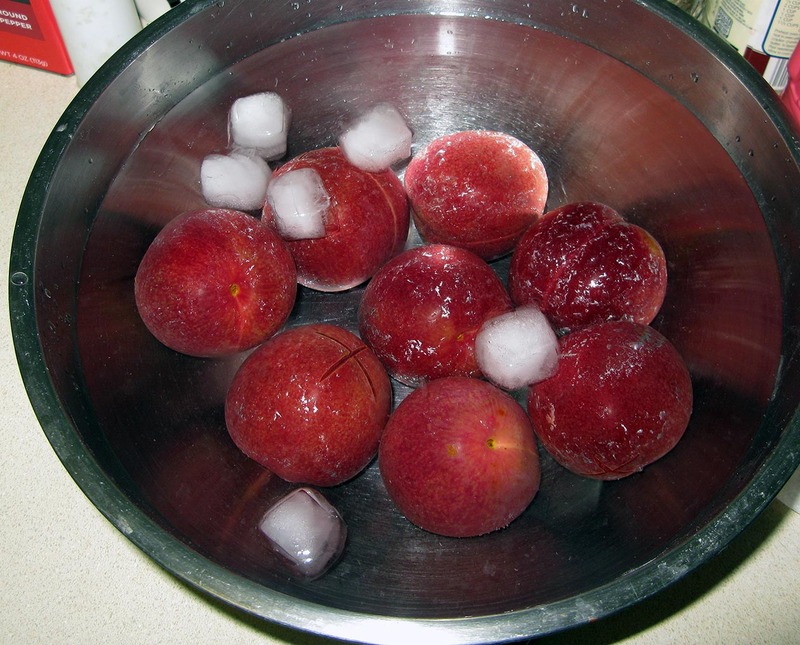 Let the apriums sit in the cold water until they are fully-cooled. You can start peeling them when they’re cool enough to handle, but I found that the skins came off easier if they’d had more time to cool (it also helped if they were a little softer to begin with). Either way, use the x you cut in the bottom of each aprium as a starting place and peel that skin off, using a knife to help you out if you get stuck. Remove the pit from each aprium in whichever way you find easiest (you can cut them in half and dig it out, or you can just cut around it until you’ve removed most of the fruit). 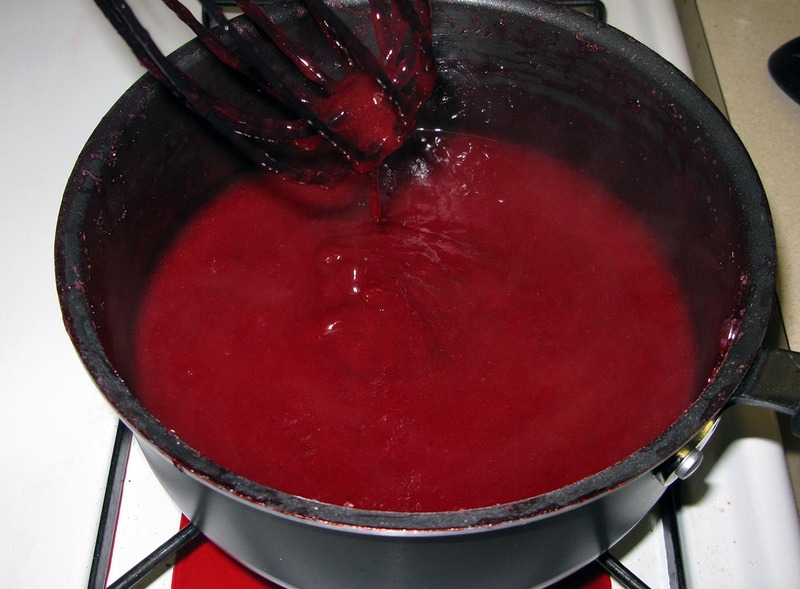 Chop your fruit into large chunks and put them in a medium saucepan. Add the zest of one lime, the juice of both limes (save the remaining lime zest for the crust), and the ground ginger. Give it a good stir and bring it to a boil over medium heat. Yeah, that happened. Thankfully, it was completely survivable (and forced me to finally clean my stovetop). 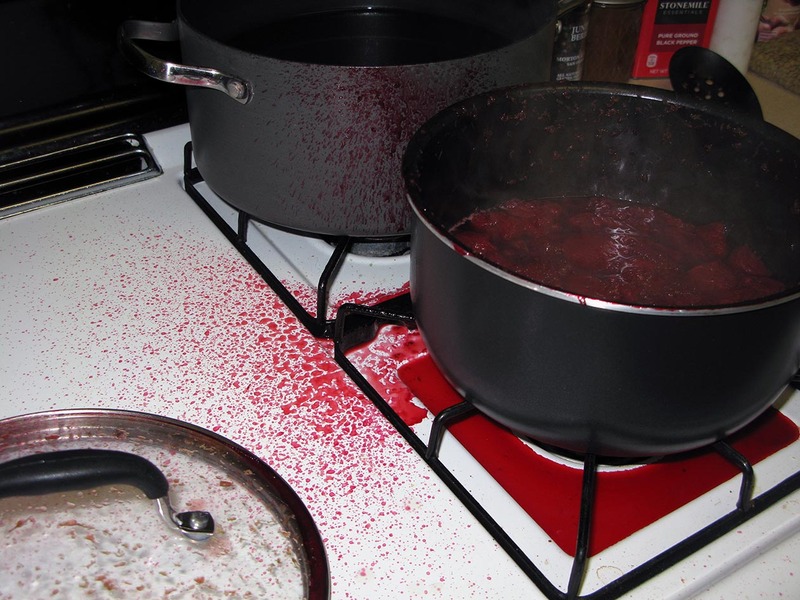 Just let it be a cautionary tale for why you shouldn’t leave things unattended on the stove. Aaaanyway, when the apriums are complete mush, remove the pan from the heat and mash them with a potato masher for good measure. 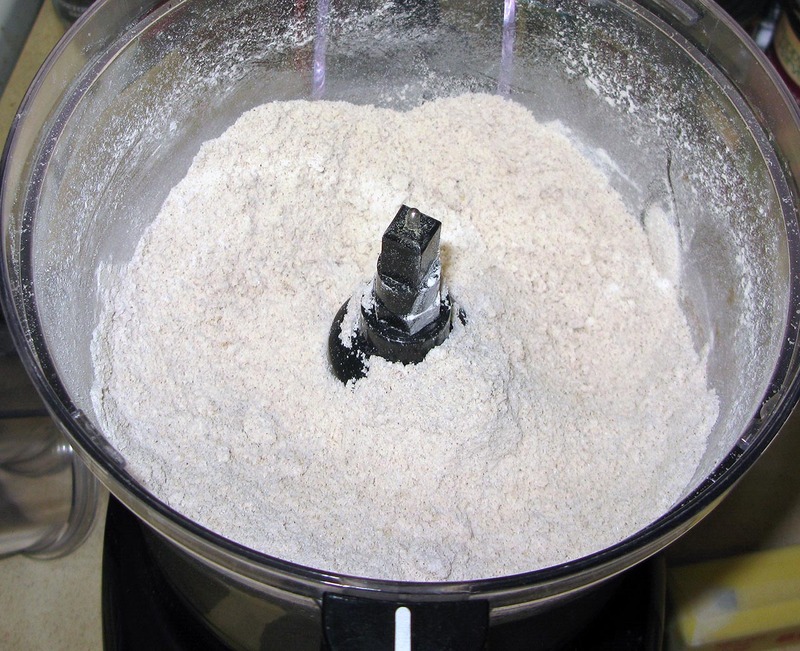 In a small bowl, stir together the granulated sugar and cornstarch until smooth. Stir this into your aprium mush. If you see little white lumps in there, switch over to a whisk to smooth it out. Return the pan to the burner and cook over medium-low heat, whisking frequently, until the filling is very thick (it should hold a little shape when you remove the whisk). Set the filling aside to cool completely. You can refrigerate it once it’s cooled to room temperature for good measure. Next, it’s time to prepare the crust. 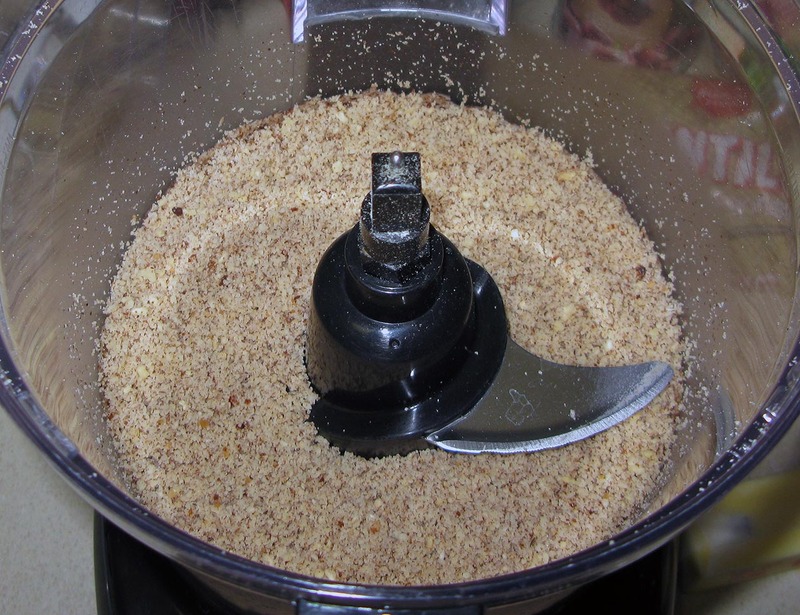 Using a food processor, process your hazelnuts on high speed until they are a fine powder. They should resemble flour as much as possible (though cornmeal is probably a more realistic expectation). Add the flour, sugar, cinnamon, cloves, and salt and pulse until well-combined. Add the butter, egg yolks, and lime zest. Process until a smooth dough ball forms. 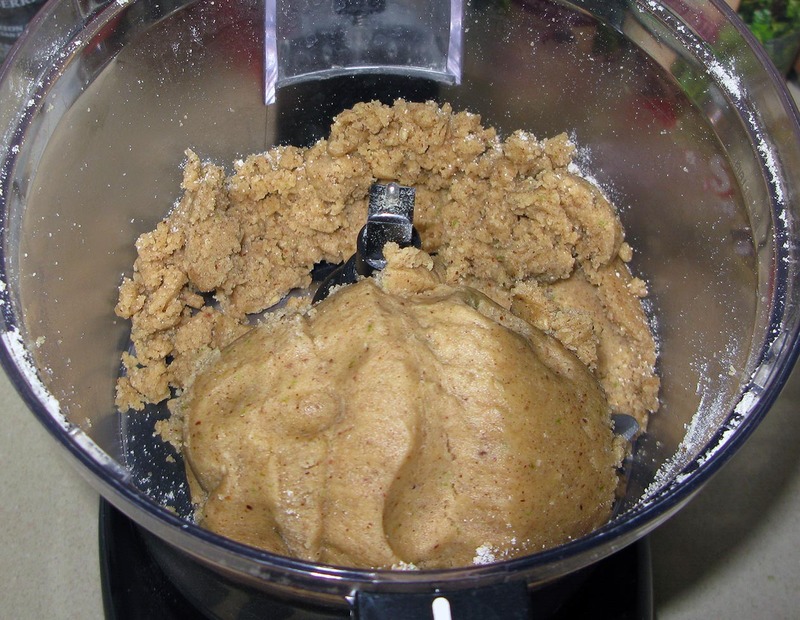 Remove the dough from the food processor and break off approximately a quarter of it. Form the small piece into a flattened square and the large piece into a flattish disc. 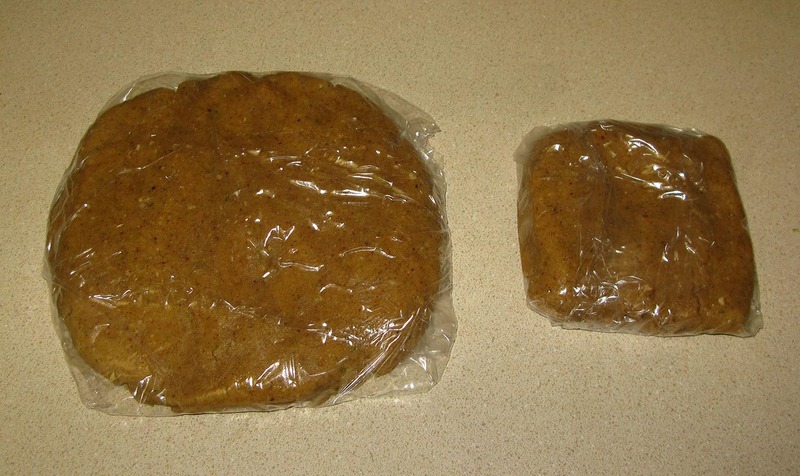 Wrap both in plastic wrap and refrigerate for at least two hours. When your dough is chilled and your filling has cooled, preheat your oven to 350°F and line the bottom of a two-piece tart pan with a parchment paper disc. Remove the dough disc from the fridge and press it onto the bottom and up the sides of the tart pan. It’s ok to make holes in the process, but be sure to fill them in and pack the dough tight so that there are no leaks. 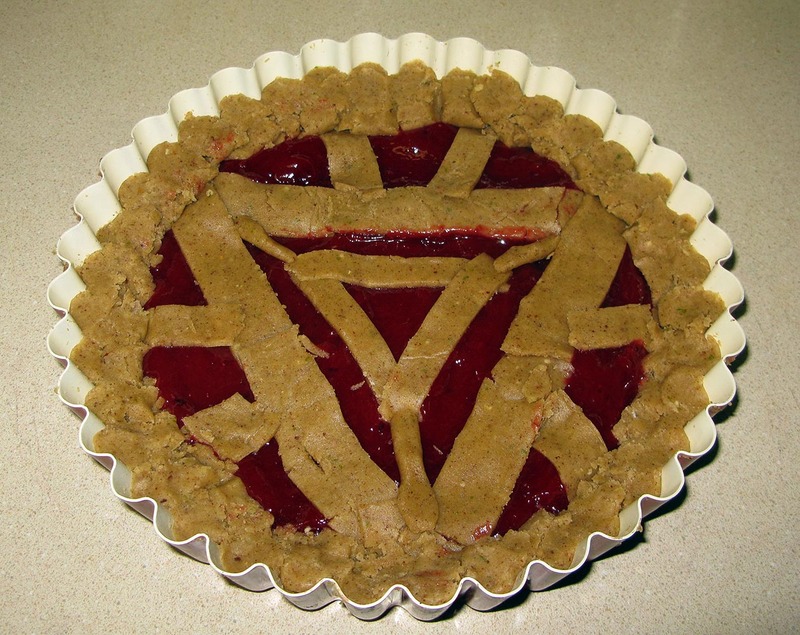 Spread a ¼” thick layer of aprium filling evenly across the crust. 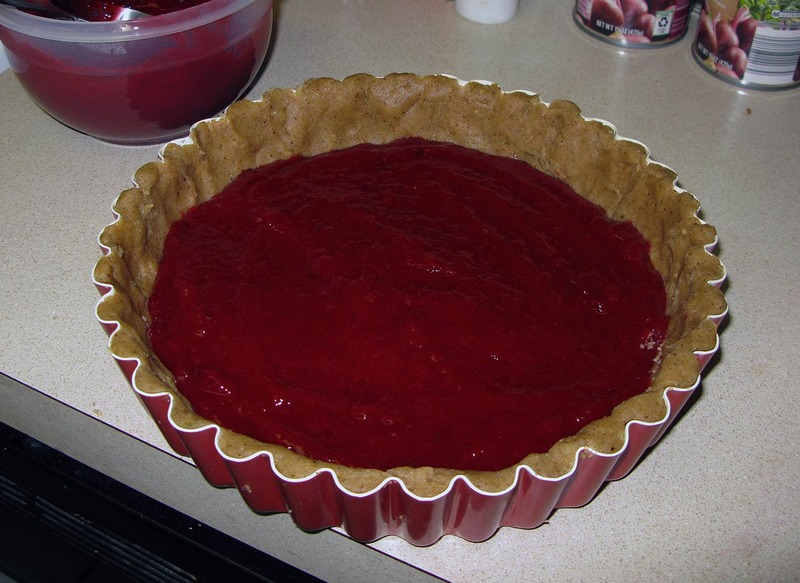 This will take about 1-1½ cups of filling depending on the size of your tart pan (I overfilled mine a bit, but I have no regrets). 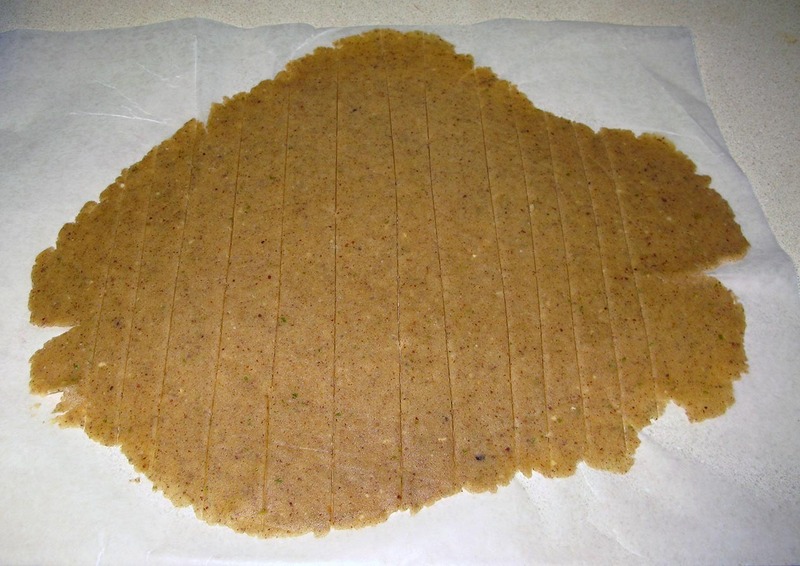 Remove the dough square from the fridge and roll it out to approximately ⅛” thick. 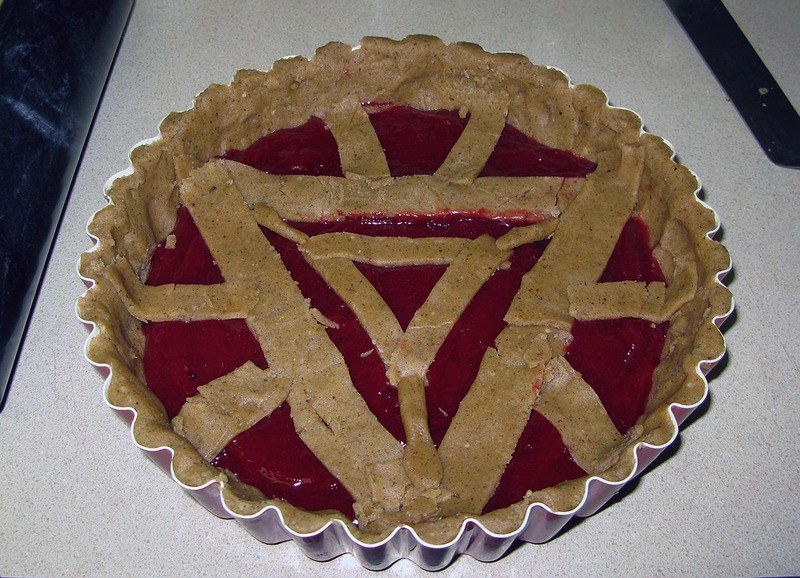 If you just want to do a lattice crust, feel free. 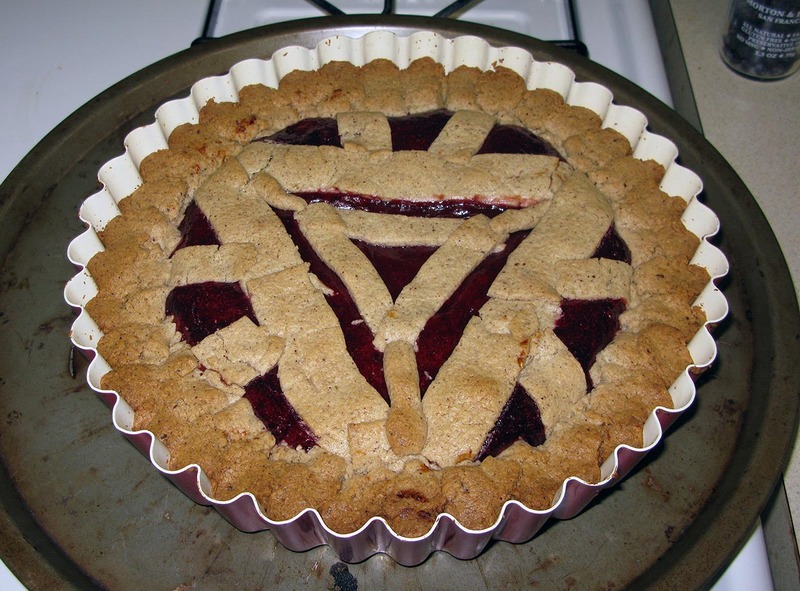 If you’re making an arc reactor like I did, cut three strips approximately 1″ thick, another three strips approximately ½” thick, and a few more strips to an in-between thickness (the measurements don’t matter so much as long as there’s some size variation). Very carefully, use the thickest crust strips to form an equilateral triangle with its corners touching the edges of the tart. You may need to use a thin spatula to lift them off your rolling surface because this dough is pretty brittle. Adjust as necessary, remove the excess crust from the ends, and press the ends into the edge crust. Now, using the thinnest dough strips, form a smaller equilateral triangle inside the large triangle, trimming the ends when you’re done. Finally, use pieces of your remaining dough strips to connect the corners of the triangles and to make the outer accents (two on each side). It will probably look pretty sloppy to you, but don’t worry about it too much, because the overall effect makes up for it. 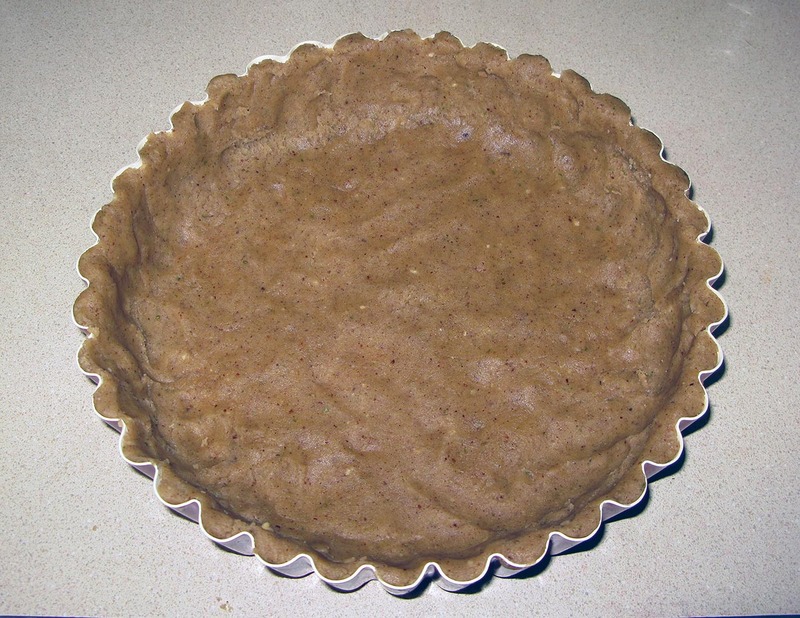 This is a shallow tart, so fold the tall crust edges over onto the filling so that they don’t stick up too far past the filling (this also conveniently disguises ugly strip connections). Place the tart pan on top of a cookie sheet and bake for 40-45 minutes, or until the top crust is golden brown. Leave the tart to cool completely to room temperature on a cooling rack, then wrap the whole pan in plastic wrap and refrigerate until cold. When you’re ready to serve, take the tart out of the fridge and carefully remove the outer edge (there will probably be some swearing and questioning of life choices at this point, because the edge almost never wants to come off on a tart pan). Slide the tart off the bottom of the pan and remove the parchment paper. Place on your serving tray of choice.